TOPOG-E Boiler Gaskets were first the dream of Mr. Frank Thomas, a professional engineer with over 47 years experience with boilers. He learned during installation workovers that it was impossible to keep the old style boiler gaskets from seeping around manholes and handholes which caused corrosion, costly downtime, production loss and shortened boiler life. After many years experimenting with various rubber formulas, (in accordance with the American Society for Testing and Materials Part 28), and after creating over 600 rubber formulations to ASTM Standards, TOPOG-E Gasket Company began manufacturing its original molded rubber gasket for boilers, water heaters, and air tanks. These gaskets are suitable for temperatures of up to 380° F and pressures of up to 180 PSI. 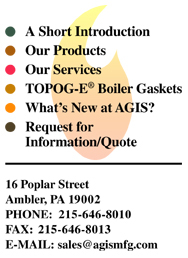 TOPOG-E Boiler Gaskets were the first to meet all this and more. TOPOG-E Boiler Gaskets have been tested in their own test boilers at 300# Steam pressure for 6 months without failure. Available in standard oval, obround, pear, round, and diamond shapes. Special shapes and sizes are available on request. TOPOG-E Boiler Gaskets . . . The gasket that conforms to the topography of the mating surfaces. TOPOG-E Gaskets are molded from a special composition that will positively stop leakage that causes corrosion around handholes and manholes in steam boilers, water heaters and air tanks. TOPOG-E Boiler Gaskets are sufficiently resilient to fill any uneven spots on the surfaces and seal openings completely. They are molded to fit any shape opening and conform to the configuration of both surfaces, stop leaks immediately and continue to seal the entire opening. No seepage or stalactites appear when TOPOG-E Boiler Gaskets are used. Also very easy to remove leaving both surfaces clean and requiring comparatively little work to put back in service. No chiseling or buffing required. Sizes are available for any size and shape inspection plates. For steam pressures to 180 psi. Temperature to 380° F.
More than 612 ASTM tests later, TOPOGE supplies 200+ easy-to-install-and-remove sizes which leave both surfaces clean. With TOPOG-E you have no chiseling, no buffing, no lost downtime, no ruined boilers. Resilient TOPOG-E conforms to both surfaces to seal immediately, seal perfectly. Cure characteristics, tensile and tear strength, accelerated aging, hardness and other variables are researched in an exceptionally well-stocked, well-equipped rubber lab busily engaged in testing materials and chemicals as rubber research develops. Formulas which pass these rigid experiments are made into TOPOG-E test gaskets and installed in the company's five continuously operating test boilers with pressures over 300 PSIG (2067 kPa). If the rubber compounds in these test gaskets withstand these rugged tests, additional gaskets are made for field installation trials. These field performance are tabulated as a last step in proving the capabilities of TOPOG-E gaskets you use.